Also today is the day where you find out what 3 or 5 mythril is really worth to you: Magicite quests expire today. Sure I'd like 3 mythril but soooo lazy. oh whew i only need 3 more, that's ok, i can do that. The misses on XV and Type-0 made me desperate for physical lightning aids, so I pulled on XIII. Hope stuff is useless. Vanille's thing is highly situational given my Larsa access but interesting (plus she's dived from ye olden dayes). Lightning AOSB is handy...hopefully it's enough. Oh dear. My FFIX pull was not so hot. 1/11 Freya BSB. I already have her USB, so this is just stats. Six more magicites. Maybe I just won't pull on any more realm banners and call it even. I'm murdering Sealion over and over to get the magicites done. Got the kill time to around 15 seconds, so only takes a minute or two each full run, depending on load times. Annoying but easy. So, Ramza is getting an Arcane Overstrike which involves him performing a combo with Delita. Normally, the move ends with the two high-fiveing to celebrate. If Ramza is wearing his Mercenary wardrobe record, Delita will be wearing some shiny gold armor himself, and the animation doesn't end quite so happily. Hmm, Vanille is going to have a pretty wild set of tools but the time 4th Anniversary rolls out. The fact that she's also getting bumped up to Support 4 is going to be a big part of that as well. That's got me seriously thinking about the XIII selection for the full throttle draw. Wrathable instant heal is always nice. Depending on which tools you have/may someday have, there's also Astra/proshellga (sadly not instant), mblink (also not instant), last stand, and regenga so she can cover a pretty wide range of heal + "other desirable effect". With Rosa getting new stuff for 4th, and Elarra for next fest, there's some nice options on the table if you can score some relics. Love it. I really liked Delia's Holy Knight sprite. Speaking of Vanille, I just did a realm pull on XIII. 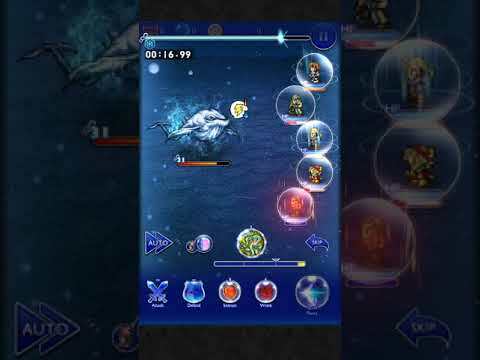 2/11, one disco - Lightning BSB2 (dupe), Vanille USB2! Another instant medica with Last Stand, nice! My Vanille now has her BSB1 and both USBs. I'm seriously debating a dive for her, since she's in line for good buffs. @Darklyre she's my main healer currently thanks to both here BSB1 and only her USB2. I really LOVE that I LDed her. She's really good with double cast white and using her BSB command she usually heals my whole party with a double cast group heal. I've got Vanille's USB1 and both BSBs and will probably eventually dive her one day. To be honest, I have a stacked healers deck though so I'm not in a rush to dive another. Did my VI draw. 2/11 with a disco both dupes. I've got a reforged magic brush and a 7* bioblaster now, I guess. Think I'm doing some math wrong. Trying to calculate my odds of getting at least one thing I am "excited" about on the XI realm draw. There are 6 such items, out of 21 total items. The guaranteed 5* has a 6/21 chance of being exciting. Assuming the other ten draws each have a 12% chance of being 5* or better (seems to be what the mass data polls on reddit suggest), each of the other ten items has ~3.4% chance of being exciting. In total, the chance that all eleven items are not-excite is...roughly 50%? 50-50 for something cool is way better than I thought I would be doing on that draw. Any probability ninjas want to look over my math? I'm in that same situation, with three dived healers and and multiple good USBs. But the more I think about it, the more I find that having just the right USB healer can utterly break a fight, like Rosa against Maliris or Larsa against Hades. Hydra down in 29 seconds! At speed 5. The savings! !!! Mog's LMR dance followup uses the dance noise from FFVI! I love that. Boy, XV Torment hits like a truck. Missed sub 30 on the 280 but a few seconds but I should probably be able to swing it. ...am I gonna have to grab Gladio's Pep Talk SSB for this? I don't actually have any buffs in the XV realm. I suppose I should first try it with Onion or Rikku as an off-realm ringer. And if that doesn't work, make XV my next 15-mythril pull. And if that fails to get me what I need, then maybe get Pep Talk. Also Sapphire Blitz (the new 6* sharpshooter) is now called Sapphire Bullet. I haven't decided yet if I hate it or not. Last Stand would be pretty helpful in that fight, yeah. Yeah, that would be nice, also. It's basically a copy of Minfilia's Blessing of Light. Which is the reason I hadn't picked it up before, as I have Blessing of Light. But this may be a reason to get it. Huh. Would have expected to be able to sub-30 with what I've got, but can't seem to. Not having anything for prompto hurts, I guess. What do I have for XV? ...it's not a very big realm, is it? Nope. I've got buffs out the wazoo, but very little for damage. No doublecast in the realm unless you've got an LMR or dive Ignis (which is fire and he's probably busy breaking). I didn't realize how intrinsic doublecast is to actually making chains get people to output damage. Oh right. I also have Noctis's dualcast Combat LMR. I guess I should try that out. Had enough mythril saved up and yanked on the FFT realm banner. Landed Montblanc BSB "Black Combo" (Deal ten magic fire, ice, and lightning attacks to one target, raise the Magic of all allies a moderate amount and Defense a small amount, and grant Haste and Burst Mode to the user. Burst Modes: Magic Combo - Deal four magic fire, ice, and lightning attacks to one target. Moogle Rush - Deal two magic fire, ice, and lightning attacks to one target, temporarily lower the user's Resistance, and raise the user's Magic a moderate amount.) I don't know how chains handle multi-element attacks- but ten shots is ten shots, and then the self-buff before unloading the rest of them, well... I think it's strong and weak at the same time- I mean, let's face it, if you're looking at elements that are commonly resisted or absorbed, you're going to be looking at those three elements. Also, don't forget to log in and grab your treats! A bunch of free three, four, and five-star motes as well as a Vampire Cloak accessory (moderate dark resist, moderate insta-death resist)! I have a decent XV spread thanks to a strong Full Throttle pull. Despite all this I still had trouble with Part 1 and haven't tried Part 2 yet. The problem is that Noctis' non-elemental stuff is just not that strong against Torments, who start out vulnerable to all elements. He's still does OK damage, and remains really useful for omniresist content, but this just doesn't seem to be his time to shine. I also think part of the problem is I have no legend dives in XV as none really seem that important. Noctis' has SPD up and an instacast LM which is interesting I guess? Noctis - Everything so far. Iris - Everything so far. Hm, that makes the choices pretty easy then. Looks like Prompto is the odd one out, despite everyone else unable to do breaks (Iggy's going to be feeding buffs to Noctis/Aranea the entire time). I could leave Gladiolus out, but he's the one with Last Stand. Chains are great with multi-element, because the buff applies to all elements. 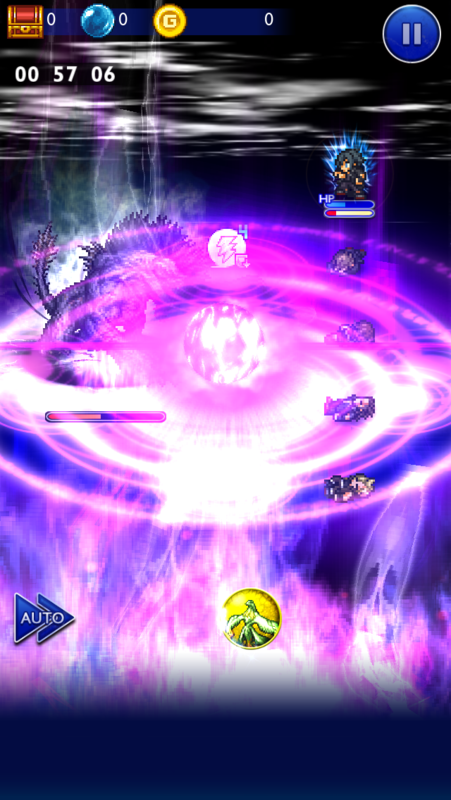 So you could open a dark magicite battle with a dark chain then use Raines, for an absurd example. Gotta get mitigation up fast, definitely want to break him as soon as he buffs himself again. Need healing pretty early on as well. If you can squeeze everyone on the front row you can avoid his back row attacks. Iris is pretty squishy though so be careful. I've also got Noctis OSB/SSB/Glint, but I'm not sure I gain much by swapping him in. Maybe the instacast might be worth it? Will have to try later. Got it down to 33.97. Not sure I'll be able to squeeze more out of that. Stopped trying to do the Noctis glint + omega drive, and instead opted for celerity abilities to build the chain and meter to instant cast BSB repeatedly. Worked a lot more effectively. I swapped out Gladio for Noctis, cracked the D280 in 28.8. I didn't do anything fancy, just had a chance to use Noctis SSB once and was able to ride that party instacast perfectly to break him after a buff, refresh RW, call in Behemoth King, and insta Aranea USB. Timing was ultimately a big factor. Next event in Japan is V.
Kelger AOSB, w-cast ninja LMR.